We are an ISO 9001 registered company with an ever-growing work force. APT is organized into four divisions: Machining, Automation, Fixture Gage, and Fabrication. The machining division handles manual machining as well as CNC production runs and boasts an excellent finished goods stocking program. Our fixture gage division specializes in weld fixtures and attribute gages. The automation division strength is in application engineering, with deep roots in robotic packaging automation, robotic machine tending, assembly line automation. 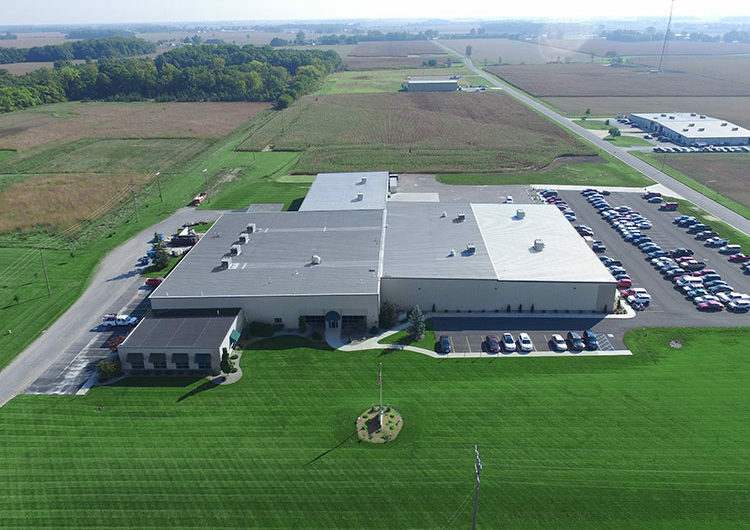 APT Manufacturing Solutions is one of the largest diversified manufacturing companies in our area with well over 100 employees. We are also proud to be one of the largest FANUC integrators in North America. Our 75,000 square foot building is a controlled atmosphere with heating and air conditioning in order to adhere to the highest standards of quality. Our mission at APT is to develop solutions for manufacturers, conduct business in an honest way, produce a product that we can be proud of, educate and train people, and provide for our families. We strongly believe that a competitive advantage of ours is the community in which we live and work. Our “farm roots” community has taught us many of the values we hold today, including hard work and integrity. We’ve been recognized by many of the largest manufacturers in the world as a company that refuses to fail and will succeed at all costs. We believe this is a direct result of the strong environment around us. It’s imperative that we continue to give back to that same community and help it flourish. We are heavily involved in the community around us through various programs. The largest is the APT Training Center. A place where high school students spend a year at APT in the afternoons learning manufacturing. We teach engineering, machining, robotics, safety, and more. Those students qualify for college credit during the year and end up with a fantastic robot project to be proud of. If you are interested in learning more, click here. APT Manufacturing Solutions is committed to meet or exceed our customer’s needs and expectations at a competitive price and to continually improve the effectiveness of our QMS.